Health food retailer Planet Organic has implemented a retail enterprise suite through specialist IT provider itim. Planet Organic stocks over six thousand lines of fresh produce with a turnover of £35 million. Staff handle daily deliveries using handheld devices for automatic ordering through a network of around 140 suppliers. Stock is also regularly transferred between stores. The retailer needs “to process transactions at the checkout quickly and efficiently, which is something itim’s technology enables us to do,” said buying director Al Overton, as it provides a stable, end-to-end solution. Online sales for direct deliveries are growing at about thirty per cent a year. Previously the company had two separate systems for online and instore products but has now united them. Holding information in a central database saves time, reduces errors and provides “improved ordering ability and visibility of stock levels,” said Overton. Planet Organic has made the switch to electronic invoicing and no longer needs to manually process 120,000 pieces of paper a year. Electronically processed invoices are automatically matched against delivery notes for improved accuracy and efficiency, enabling the company to process higher volumes with less staff. 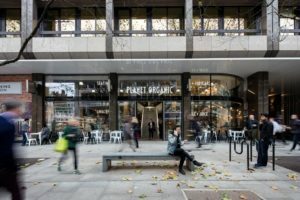 With new and improved processes, Planet Organic now aims to focus on expanding its presence in London and launch more of its own branded range of organic products.